Get in the Christmas spirit by partaking in a wide variety of holiday-inspired events throughout Stratford during the town’s 2018 celebration of the Christmas season. All the elves in Stratford are excited to welcome you to town, so they can show you the delicious, heart-warming and unique gifts they want you to indulge in this winter. See Stratford come alive. 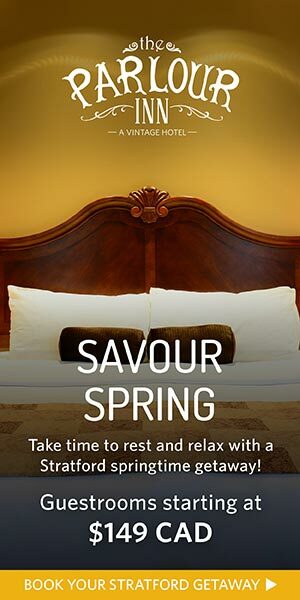 From decorations strewn throughout our historical streets through to live entertainment and unparalleled dining, you’ll soon realize why Stratford is Ontario’s favourite place to visit leading up to, and long after, Santa’s visit. 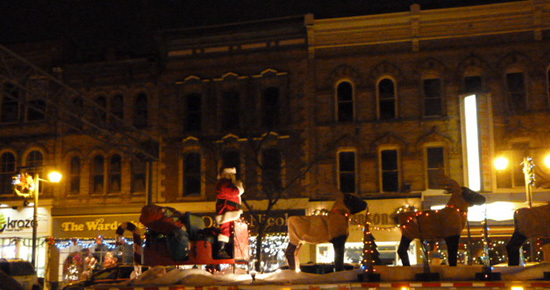 Every year, Stratford boasts one of Ontario’s best Santa Claus Parades, and this year promises to exceed all previous expectations. The floats begin at Lakeside Drive and make their way towards City Hall – with the man in red leading the way for all to enjoy. The best-loved floats will be awarded prizes, guests will get free hot chocolate and snacks at City Hall, and there will be enough music and carols to ensure everyone in town is in the Christmas spirit. Date: November 25, 2018, at 4 p.m.
Before you head out for Stratford’s famous Parade of Lights, enjoy a relaxing and delicious breakfast with Santa Claus at The Parlour Inn. We know Santa always manages to sniff out milk and cookies, but at The Parlour Inn, you’ll be treated to a much more diverse, locally-inspired and mouth-watering meal than any you can find beside the chimney. Have your photo taken with Santa and take part in our colouring contest that ends December 15th, for a chance to win a $25 prepaid Visa card. Date: Sunday, November 25, 2018 and Sunday, December 2, 2018 – From 10 a.m. – 1 p.m.
Do you still need to get all your holiday shopping done? Instead of facing the hustle and bustle of an overcrowded mall, why not enjoy leisurely exploring Stratford’s festively decorated streets as you browse unique presents made with tender loving care by local artisans. Businesses from the community have come together to select stocking stuffers just for you, so prepare to find the perfect gifts (and maybe spot a few swans-a-swimming while you shop!). Event dates: November 1 to December 20, 2018 (Tuesday through Saturday) – From 10 a.m. to 6 p.m. Cost: Stratford Tourism has set up a special offer, so you can get six gifts for $30 from a selection of 25 businesses participating in the Christmas Trail. Get ready for an extraordinary display of light, sparkle and Christmas spirit in Milt Dunnell Field. This Winter Lights Display is so impressive and sizeable, you can actually drive around it. But, a stroll through the festive displays will make for a fun and very romantic way to spend one of your winter nights. Experience the holidays at a local historical landmark, visit Castle Kilbride and take part in A Merry Victorian Christmas. See the house lit up from roof to garden with Christmas lights. During this evening event, you can tour the castle and sip on cider, while you shop the event’s silent auction. Date: December 6, 2018 – From 6 p.m. to 8:30 p.m. This year, the display, which is kindly loaned to the heritage home by the Herner family, will feature an ode to Charles Dickens. Do you hear those sleigh bells ringing? Take part in the time-tested tradition of riding through the beautiful streets of Stratford in a horse-drawn carriage. Remember to dress warmly and meet your driver and an elegant team of horses at City Hall. From there, you’ll travel down Wellington and experience the winter wonderland of scenic Stratford during the Christmas season. Dates: November 24 – November 25, 2018 – From 12 p.m. to 3 p.m.
We all know a visit with Santa is the quintessential Christmas activity. Stratford is proud to host this special event in the heart of town at the Market Square. Come to visit the big guy and be sure to let him know what’s on your wish list. Even if you don’t get everything you ask for, you’ll certainly have the nicest time in Stratford, enjoying the company of your loved ones alongside all our festive offerings. Dates: November 24 to December 16, 2018 – From 12 p.m. to 3 p.m.
Stratford’s Christmas Market is one of our town’s favourite holiday events, and it’s one you definitely need to check out this winter. During this one-day event, dozens of Stratford artisans and food vendors come together to ensure you have everything you need to check off your Christmas to-do list. This event promises fun and wonders for the whole family, as kids are welcome to create Victorian Christmas crafts, get their faces painted and enjoy the frolicking fun of a carriage ride. Best of all? Santa always makes a surprise visit, so don’t be naughty and miss out on this spectacular seasonal affair. 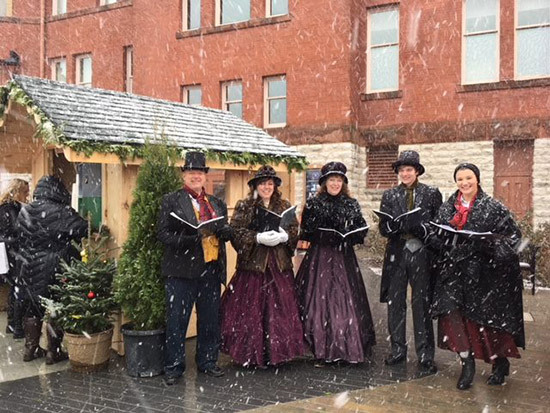 Date: November 25, 2018 – From 11 a.m. to 4 p.m.
For decades, Stratford has established itself as a place of romance, community and great spirits during the holiday season. The locals and our talented artisans always look forward to this time of year because it gives us the opportunity to showcase how beautiful, historically rich, delicious and homey our quaint town really is. 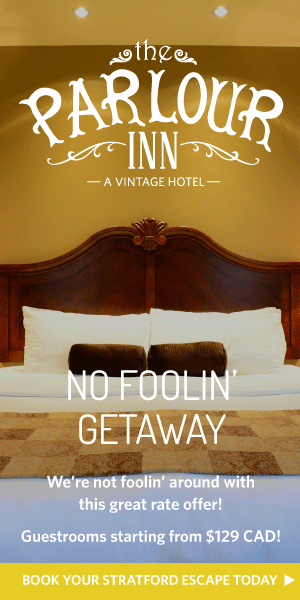 Book your holiday getaway in Stratford at The Parlour Inn so you can be centrally located to all the great Christmas fun, while also getting to unwind after a long day in upscale accommodations. We can’t wait to wish you a wonderful Christmas season.